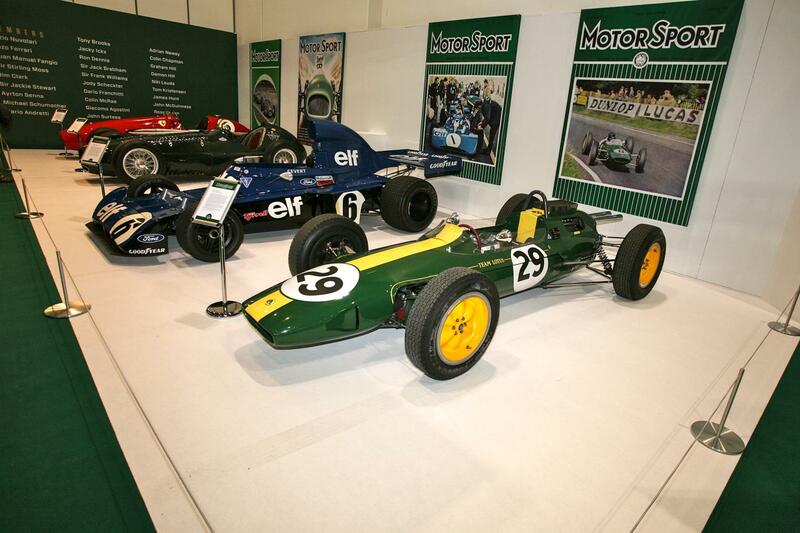 The purr of stunning classic cars, the raucous yowl of an evocative F1 car, the excited chatter of thousands of visitors and the constant clicking of cameras… these were the sounds of a hugely successful inaugural London Classic Car Show. Indeed the new show, which closed its doors on Sunday night (11th January) after a four-day run at ExCeL in London’s Docklands, was such a massive triumph that plans are already well advanced for the 2016 event. “Our first London Classic Car Show has exceeded our wildest dreams,” said Event Director Bas Bungish. “The feedback from visitors and exhibitors has been universally positive. Packed full of innovative features, highlights included a special display focusing on the career of legendary Formula 1 designer Adrian Newey. There were also displays of iconic cars from Le Mans courtesy of Octane magazine and the Motor Sport Hall of Fame, while James May from BBC Top Gear chose the car that changed the world – he believes it’s the Corgi James Bond Aston Martin of which more than six million were sold. James Martin provided the show with another unique dimension; the TV chef and petrol-head providing show goers with a well deserved pit-stop at his James Martin Classic Café. But perhaps the show’s defining feature was The Grand Avenue presented by Motoriety. 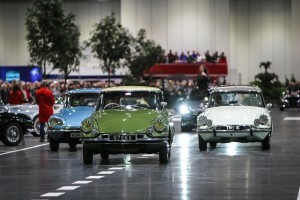 Running the entire length of the hall, The Grand Avenue brought the show to life as dozens of classics from pioneering veterans to sixties supercars – were put through their paces during the show. While the spectacular blasts by F1 cars put smiles on faces it was mouth watering Ferrari 250 GT California Spyder SWB once owned by film star James Coburn and valued at more than £10m that won the most hearts and thus took the People’s Choice Award sponsored by Admiral. “The idea behind The Grand Avenue was to allow visitors to see and hear some iconic classic cars in action… and it proved so popular that we had to arrange extra shows,” said Bungish. The show was launched with a spectacular VIP Preview evening on Thursday (8th January) attended by stars of track and screen. May, Martin and Newey were joined by ex-F1 drivers Martin Brundle and David Coulthard, Red Bull team principal Christian Horner and TV presenter Jake Humphrey while BBC Radio 2 broadcaster Chris Evans took over as MC. No fewer than 25,200 visitors attended the show over its three full days… and they came with an urge to spend money. Dealers reported countless genuine enquiries and some serious purchases too. 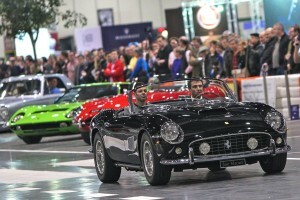 Among the notable cars sold off stands were a £1.5m Ferrari, three £500,000 Aston Martins and a £500,000 E-type Jaguar. But it wasn’t all million pound motors. There were also hundreds of more affordable, but equally desirable, classics up for grabs. Manufacturers including Maserati, Aston Martin and Citroen – the latter celebrating the 60th anniversary of its avant-garde DS – were also overwhelmed by the quality of enquiries. And Motor Sport magazine found its tribute to motor racing’s greatest names so popular that it sold out of its current issue not once, but twice. It was the same story throughout ExCeL with the James Martin Classic Café reporting double the expected number of customers and busy trade stands enjoying huge interest. Indeed more than 80 per cent of exhibitors have already rebooked for 2016. 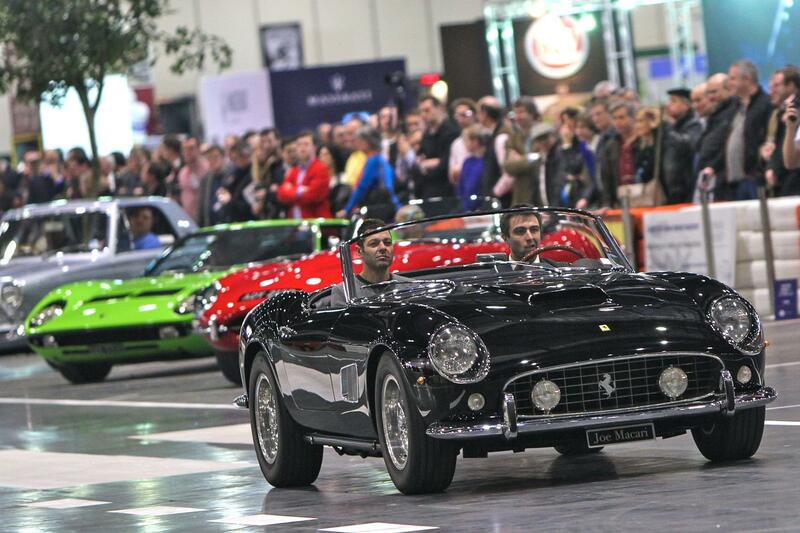 And with the 2016 London Classic Car Show promising to be even better make sure you don’t miss out by marking the dates in your diary now: ExCeL, 18-21 February 2016.